Five generations of cranky German ladies. 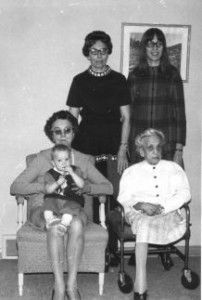 From bottom right, clockwise: Alvina Pirius Quast (great-great-grandmother), Clara Quast Schultz (great-grandmother), Lavarian Schultz Post (grandmother), Jeanette Post Hauschildt (mother), and I’m the baby in Clara’s lap. Must have been taken around 1972 given my age in the photo; can’t be any later than 1974 as that’s when Alvina died. I was born in 1971 but have no memory of her at all. Posted in Genealogy and tagged hauschildt, pirius, post, quast, schultz.